Mike O'Driscoll has overseen the introduction of an all-new Jaguar product lineup. MUNICH -- Jaguar Managing Director Mike O'Driscoll will retire from day-to-day operations at Jaguar Land Rover at the end of March 2011, the automaker announced today. No successor has been named. 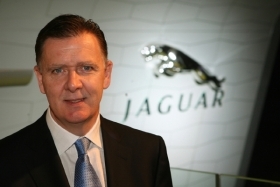 Following his retirement, O'Driscoll, 54, will remain chairman of Jaguar Heritage, an independent trust that manages Jaguar's museum, archives and global car collection. O'Driscoll succeeded Bibiana Boerio in 2007, moving to the UK from the United States where he was president of Jaguar Land Rover North America. O'Driscoll arrived after Ford Motor Co. announced its plan to sell Jaguar and Land Rover. He led the Jaguar brand through the sale process to Tata Motors Ltd. in 2008. As managing director, he also has overseen the introduction of an all-new product lineup that includes the XF, XK, and XJ. "Being part of the team that rebuilt this great brand has been a huge privilege and a gratifying way to sign off my long career with Jaguar,” O'Driscoll, who started his automotive career with Jaguar Rover Triumph in 1975, said in a statement. “The resurgence is symbolized by the wonderful reaction to our new products and to the stunning C-X75 supercar concept we showed at the recent Paris auto show." Said Jaguar Land Rover CEO Ralf Speth in a statement: "I would like to express my gratitude to Mike for his commitment and dedication to Jaguar Cars. His passionate leadership has been vital to Jaguar during this time in its history. He will return to his home in the U.S., and we wish him all the very best for the future."